I first watched Uummannaq appear from the sea. In the golden haze of morning light, a single spire loomed silhouetted on the horizon; icebergs filling the ocean ahead. Mountains lined both side of the ship, purple in the glow of dawn, glaciers zigzagging their way towards the sea. As the sun’s rays began to pour over the land, the colorful houses of Uummannaq came into view, perched upon the red stone of the town’s heart-shaped mountain. 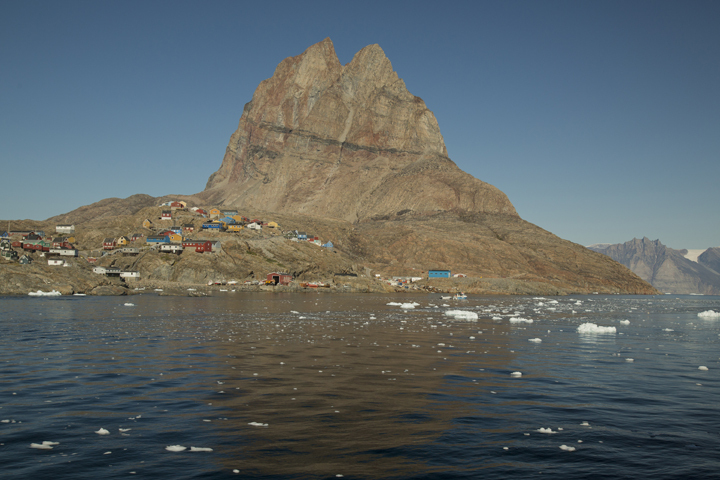 Uummannaq struck me initially as a place of impossibility, so surreal did it first appear. Lined up in the sea beside it stood a massive wall of gargantuan icebergs, like immense ships waiting their turn to enter port. As we neared the town, part of one calved and collapsed into the sea; a flurry of commotion ensued as fishermen and hunters rushed to clear their boats from the harbor should a tsunami result. We soon learned that only the day before, one of the mammoth icebergs had overturned, causing a wave that wreaked havoc upon the town and destroyed several boats. A certain uncertainty hung in the air around the icebergs, a peculiar mixture of awe and fear in the face of their crystalline beauty. With a watchful eye towards the sea, however, life on shore resumed as usual. I accompanied a group of travellers with Elizabeth, a Greenlandic woman who smiled all the time and spoke softly in Danish for me to translate. Beckoning happily, she led us far up the slopes of the village, the view growing more and more spectacular as we climbed. 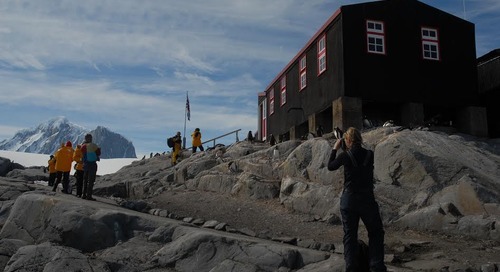 Eventually we reached the summit, where panoramic views of the colorful Danish kit houses, the red stone landscape, and the icy sea surrounded us in all their glory. Inside her mountaintop home, Elizabeth had prepared a feast of local cuisine – narwhal, seal fat, seal soup, halibut, cakes, and coffee. I sat for a while, letting a piece of seal fat dissolve in my mouth like butter, marveling at Elizabeth’s family photos scattered in frames across the walls. What a life, I thought, to awake every day looking down at this. Later that afternoon we watched some hunters pulling pilot whales into the harbor behind their boats, following them as they proceeded to butcher the animals on the shore behind town. With the hunters’ permission, I found myself holding the fins of the whale in my hand, amazed by their thin and paperlike skin and sharp teeth. So much food, I remember thinking, looking at the thick layer of blubber underneath the animal’s skin. Crimson pooled at the ocean’s edge as hunting boats zipped back and forth in the sun. Our new Greenlandic friends accompanied us aboard ship that night as we cruised up and down the coast in the sunset light.  The scenery, more dazzling than ever in the magenta hue of dusk, took my breath away, but it was Elizabeth’s reaction to her own home that made the deepest impression. Together we stood out on deck, speechless at the overwhelming beauty of the land. She gestured towards her town, her mountain. Hjerte, she said softly, holding her hand over her heart. Understanding she was speaking of more than just the mountain’s shape, I nodded in agreement. I would not forget Uummannaq. 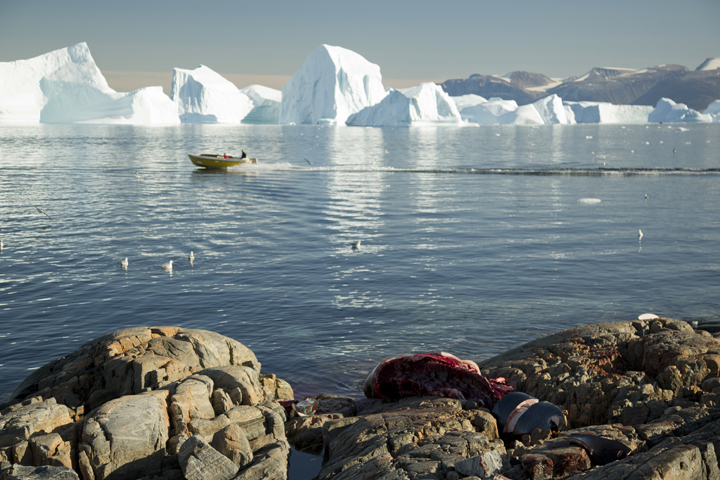 Want to learn more about the incredible things you can see, do and experience in Greenland? 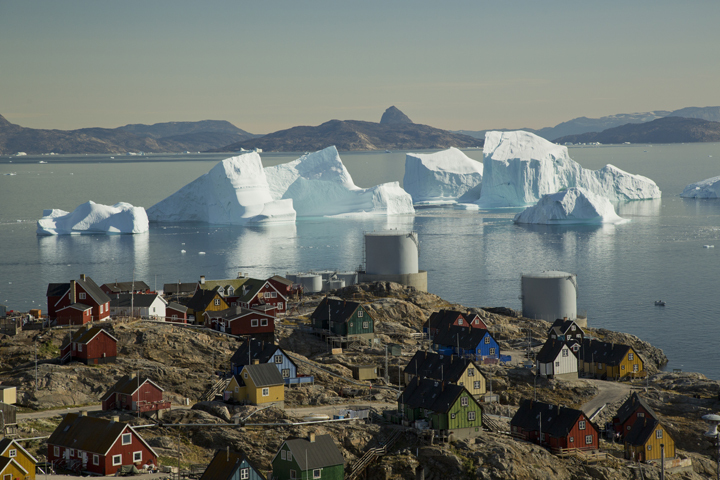 Download your Greenland Destination Guide and start dreaming!